Our emergence as a leading domestic packaged drinking water company dates to 1997 in the banyan city of Vadodara. In the year 1990 Lalit Beverages Pvt. Ltd. Franchisee to BISLERI BRAND of Parle Argo. Started manufacturing the packaged drinking Watercin their " State of the art " plant at GIDC Estate Makrapura, Vadodara. Since our presence in Packaged Drinking Water industry was already their from 1997 with the manufacturing of Kingfisher & Belly Brands of Mineeal water under franchise agreement. It was only in the year 2005 we launch our own branch Can...I. Thereafter there was no looking back. Today we are one the major brand trying to spread pan India bases with our slogan the " the thirst quencher"
Can...I will soon quench thirst of millions of thirsty mouth with quality safe drinking water. It is needles to mention that water a compound of hydrogen and oxygen is a precious natural gift which is very essential for survival of mankind including animals. Pure and safe drinking has always been a necessity. The mineral water is one of the important item which is directly consume by people all over the world. Mineral water is bottled under very hygienic conditions under strict quality control. 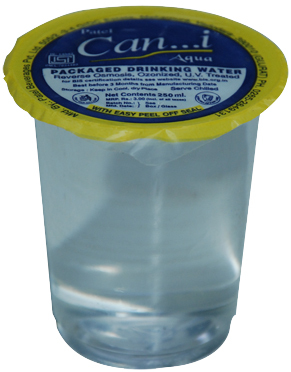 The demand for packaged drinking water becomes more during summer season. The water available from untreated sources such as well, boreholes and spring is generally not hygienic and safe for drinking thus, it is desirable and necessary to purified the water and supply under hygienic condition for human drinking purpose. As the name implies, the mineral water is purified water fortified with requisite amount of mineral like Calcium, Magnesium, Potassium, Sulphate, Chlorides, Iron, Nitrates etc. which can be absorbad by human body.